LEADING SCORERS: Bulls: Lemon: 20 points. 76ers: J. Simmons: 20 points. LEADING REBOUNDERS: Bulls: Selden: 8. 76ers: Johnson: 9. LEADING ASSISTS: Bulls: Arcidiacono: 6. 76ers: McConnell: 6. CCI RECAP: Philly led wire to wire. Both teams were missing “A” list players. Walter Lemon Jr. scored 20 points, grabbed seven rebounds and dished out five assists. The Bulls did a solid job scoring 62 points in the paint. POST GAME REMARKS FROM COACH BOYLEN: "Well I’m excited, you know, we picked up Wendell [Carter Jr.] last summer and we got a hell of a player in Wendell. We picked up Otto [Porter Jr.], we got a hell of a player in Otto. Zach LaVine, first stretch of the season he played as good of basketball as anybody in the league. 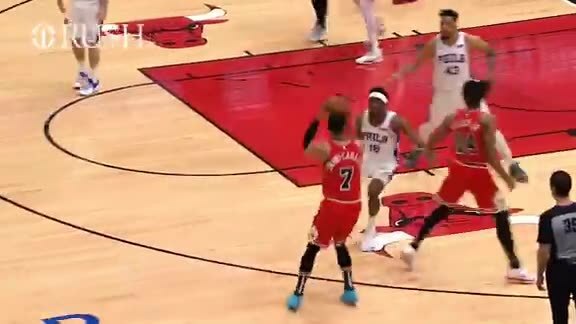 Lauri Markkanen, I believe, in February kind of showed a glimpse of who he could be and established a style of play, got multiple ball handlers, assists and also ball movement. You know, playing together is huge, so I’m encouraged, I’m excited. I think we’re in a great place to build from. If I had a criticism, I think we have to get tougher. We have to get more physical. We have to play better at home and we have to honor the defensive end of the floor as a group." Up next: NBA lottery May 14 in Chicago. Brooklyn 113, Miami 94. The Nets open up the playoffs in Philly. Dwyane Wade capped off a Hall of Fame worthy career with a triple- double of 25-11-10. The Nets finished regular season play at 42-40. Miami collapsed down the stretch and finished four games under.500. Catching Wade’s final game: LeBron, Melo and CP3. Orlando 122, Charlotte 114. Kemba Walker, a free agent in waiting, scored 43 points. The Hornets were eliminated from the playoffs. Terrence Ross scored a season high 35 points for the Magic. Orlando will open the playoffs in Toronto. Detroit 115, New York 89. Andre Drummond scored 20 points and grabbed 18 rebounds. It was Drummond’s 27th game of 18+ rebounds in a single game. The Pistons claimed the eighth seed and will open the playoffs in Milwaukee. New York finishes with a 17-65 mark. Oklahoma City 127, Milwaukee 116. Russell Westbrook notched his 34th triple-double of the season. The Thunder claimed the sixth seed in the Western Conference. Los Angeles Clippers 143, Utah 137 OT. The Jazz take on the Rockets in the first round and this sports fans should be an awesome series. Veteran Clippers broadcaster and Hall of Famer Ralph Lawler called his last regular season game after a distinguished 40 year career. San Antonio 105, Dallas 94. LaMarcus Aldridge had a big night scoring 34 points and grabbing 16 rebounds. Dirk Nowitzki played his final NBA game and finished with a 20-10 night. Dirk ends his career scoring 31, 560 points- sixth all time. Indiana 135, Atlanta 134. Edmond Sumner nailed three free throws with three tenths of a second on the clock as the Pacers beat the Hawks. Atlanta’s John Collins had a tremendous night at the office scoring 20 points and pulling down a career high 25 rebounds. Memphis 132, Golden State 117. The Grizzlies scored 86 first half points. Jevon Carter from Chicago scored a season high 32 for Memphis. The Warriors meet the Clippers in the opening round of the playoffs. Portland 136, Sacramento 131. The Kings scored 87 first half points against a depleted Portland roster, led by 25 at the break and lost the game. The Blazers host OKC in the opening round of the playoffs. A huge blow to the Celtics as Marcus Smart will be sidelined four to six weeks with a left oblique injury. Coach of the Year: Mike Budenholzer - Milwaukee. CCI FINAL THOUGHTS: Thank you so much for reading CCI this season. During the off season I’ll return with thoughts on the NBA as the Bulls prepare for a busy summer of activity. Our Bulls.com staff is tremendous and their attention to detail and professionalism is second to none. I sincerely appreciate every member of the department as I do every Bulls employee. I am optimistic about our future and looking forward to the 2019-20 campaign. Reach out to cswirsky@bulls.com or Twitter: @ctsbulls. Always a pleasure!